As with a lot of historical events, Hollywood has glamorized and largely fictionalized the feud between the Hatfields and the McCoys. So what really happened? The McCoys came from Scotland, but would move to Ireland, before coming to the new world. The first known McCoy in America was John McCoy, who moved there with his wife (and possibly two brothers) in 1732 by way of Belfast, Ireland. With a 150 acre land grant in hand, John, and whatever family was with him, settled in Charles County, Maryland. He died in 1760 as a very prominent land owner. The first Hatfields to move to the Tug Valley region, the site of the historic feud, was Ephraim Hatfield and his second wife, Ann Musick, along with their ten children around 1820. They came from southwestern Virginia, looking for open land to settle and farm on. He was nicknamed “Eph-Of-All” due to the fact that every Hatfield in the region would be descended from him. His son, Valentine, was already grown by then and produced his own child, one of which was named after his father, but given the nickname “Big Eph” due to his six foot four and 240 pound frame. Big Eph’s son would be William Hatfield, otherwise known as “Devil Anse” and a main character in the Hatfield & McCoy saga. William McCoy (son of John) moved with his 12 kids and wife to the Tug Valley region around 1802-1804. As the children got older, they began to populate both sides of the river, on the Kentucky and West Virginia side. His granddaughter was Sarah “Sally” McCoy, who would end up marrying her cousin (the son of her great uncle), Randall McCoy. They would be the patriarch and matriarch of the McCoy clan during the feud. The first shot fired in the Hatfield & McCoy story was the murder of Asa Harmon McCoy, but there were other factors that helped the pull the trigger. The Tug Valley region was full of natural resources, most notably timber. With war production and the specter of industrialization coming after the war, timber was a extremely valuable commodity, along with the land it resided on. Additionally, both clans (especially the McCoys) were distrusting of other families due to their isolation, so much so that they often ended up marrying within the family. William Hatfield was about 15 years younger than Randall McCoy and, by 1880, was significantly better off financially than Randall due to his successful timber business. While McCoy owned land, farm, and a small timber operation, there was harbored resentment towards the Hatfields. Asa Harmon McCoy, the younger brother of Randall, arrived back to the Tug Valley region in January 1865 after being medically discharged by the Union Army on account of a broken leg. In this part of the country, being a Union soldier was not something admired. The Logan Wildcats, a guerrilla militia group, “protected” this region and was headed up by Devil Anse Hatfield himself. But the animosity between Harmon McCoy and Hatfield was much more personal. Harmon McCoy was ordered by his Union commander to fight Devil Anse, due to the belief that he was a Confederate spy. Harmon lost the fight, but the Union troops went after Devil Anse anyway. Later, Harmon would shoot a friend of Devil Anse while stealing his horse. In turn, Devil Anse killed Harmon’s commanding officer, General Bill France, while he urinated off his front porch. In January 1865, there was a rumor circulating that Harmon was going to kill Devil Anse himself for killing General France. That rumored ended when Jim Vance, Devil Anse’s uncle and member of the Logan Wildcats, shot Harmon while he walked home to his family that he hadn’t seen in years. In truth, some historians believe that this event didn’t start the feud, but rather was more of an isolated incident or, even, a murder agreement. Many in the McCoy family didn’t like Harmon either, due to his allegiance to the Union cause. Frankly, while the Hatfields and McCoys didn’t like each other very much, they liked the Union and President Lincoln even less. In 1878, thirteen years later, a stolen pig added fuel to the fire between the Hatfields and McCoys. In the southern Appalachian region, food was scarce. A full-grown razorback provided meat and was a huge trade chip within the economy. According to Dean King’s book The Feud, a razorback “was where their next meal was going to come from, and how they could feed their children in the winter. If they were lucky enough to have one for sell or trade, the proceeds were used to acquire flour, sugar, and coffee or sometimes shoes or boots for their families. It was a mainstay for their family.” Needless to say, hog stealing was a big deal. In the winter of 1878, Randall McCoy thought he was missing a prized razorback and followed the tracks to Floyd Hatfield’s place (who was also related to Randall McCoy’s wife). When questioned, Hatfield insisted it was his razorback, despite the earmark being nonexistent or indistinguishable (hog’s earmarks usually could determine whose pig it was). Randall McCoy was infuriated and took the matter to the Justice of Peace, Preacher Anse Hatfield (a cousin of Devil Anse – everyone was related). 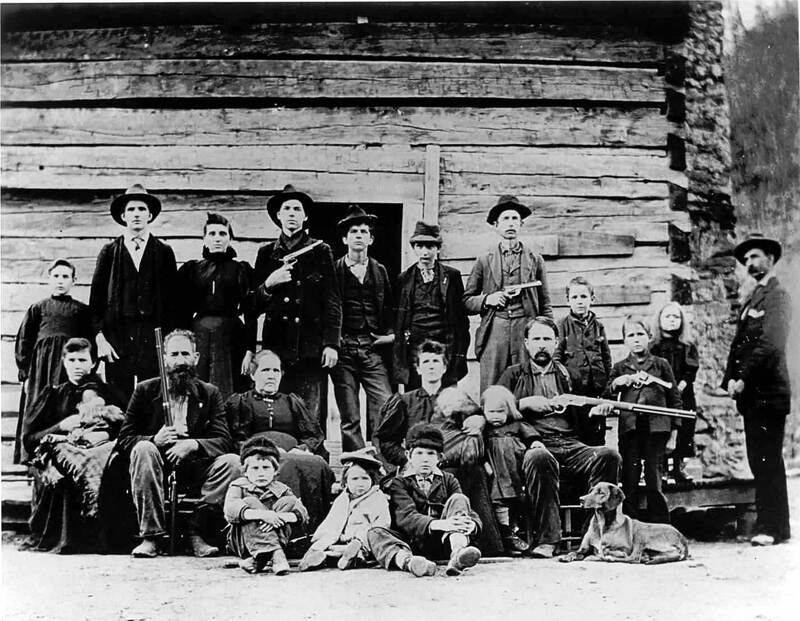 A “jury of peers” was set up with six Hatfields and six McCoys. In the end, the final verdict depended on the testimony of McCoy’s nephew, Bill Staton. He said the pig belonged to Hatfield. A McCoy on the jury ended up siding with the Hatfields and by a 7-5 vote, the razorback belonged to Floyd Hatfield. A few months later, Bill Stanton was killed by two McCoys and the feud turned bloody. In August 1882 (on Kentucky election day), three of Randall’s sons attacked, stabbed 26 times, and shot to death Devil Anse’s younger brother, Ellison Hatfield. Apparently, the attack was unprovoked. They were arrested, but were kidnapped on the way to trial by Hatfields. Instead of a trial, the three McCoy brothers were tied to pawpaw bushes and shot to death. The Hatfields, including Devil Anse, eluded arrest. It all came to a head on January 1, 1888, when a big group of Hatfields raided the McCoy’s camp, setting it on fire, and killing three or four McCoys (depending on who was asked), including Alifair McCoy, daughter of Randall, and Sara McCoy, the wife of Randall. This became known as the New Years’ Night Massacre. In response, nine Hatfields were taken to trial for the murders; seven received life imprisonment and an eighth was hung. With this final act of violence, a truce was ordered by both families in 1891. Trials continued until 1901 with even the United States Supreme Court getting involved. All in all, over an eleven year period (1880 to 1891), nearly two dozen people were killed combined from both families. 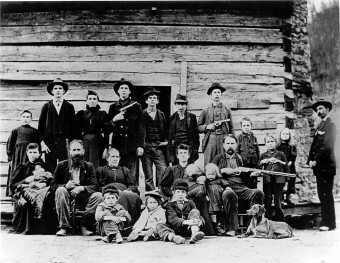 The violence earned the Hatfields and McCoys legendary status as America’s go-to feud, something that has continued to this day. Around 1880, a courtship developed between Rosanna (daughter of Randall) and Johnse Hatfield (son of Devil Anse), setting up a perfect “Romeo and Juliet” scenario. Despite what the History Channel’s mini-series would have you believe, it wasn’t particularly romantic. Johnse was something of a lady’s man and convinced Rosanna to meet him in the woods one day, got her pregnant, and promised to marry her. He didn’t and ended up marrying Rosanna’s first cousin, Nancy, instead. You say that Ephraim Hafield, father of Devil Anse was given the nickname “Big Eph” because of “His six foot four and 240 pound frame.” Big Eph’s military record shows him to have been six feet even. The “Big” appellation was common in the Tug Valley at the time to distinguish between two or more persons with the same name. Ephraim had two nephews and a grandson named for him, and was called “Big Eph” only to denote his seniority. Asa Harmon received a regular–NOT a medical–discharge on Christmans Eve, 1864. He immediately re-enlisted and was sent home for a holiday furlough. He was killed by Rebels (unknown) while on his way back to his regiment. He broke his leg in April, 1864, and was back in action for his Regiment’s march on Lexington in August. You say: “In this part of the country, being a Union soldier was not something admired.” In fact, there were more than fifty of Harmon’s Peter Creek neighbors who wore the Union blue, and fewer than half a dozen Confederates. I won’t quote the remainder of the paragraph, but William Francis was NOT a General. He was a leader of a company of Peter Creek Home Guards, which was nothing more than a gang of raiding and robbing cutthroats, robbing farmers without regard to their loyalties in the War. Asa Harmon was never a member of Francis’s company. He joined the Home Guard unit commanded by Uriah Runyon in February, 1862, and was critically wounded in a skirmish the day after he joined. Asa was captured by the Virginia State Line in November, 1862, and spent several months in Libby prison. Fully recuperated, he went to Ashland and joined the 45th Kentucky Infantry in October, 1863. The Logan Wildcats were actually Company D of the 36th Virginia Infantry, part of the regular Confederate Army. The Logan Wildcats never operated within a hundred miles of Tug Valley, and Devil Anse Hatfield was never a member of that outfit. Jim Vance was never a member of the Logan Wildcats, and not an iota of evidence places him anywhere near Harmon McCoy in January, 1865. The story did not surface until after Vance was murdered in 1888. On your “pig trial,” please be aware that Preacher Anse Hatfield was not even a justice of the peace in 1878. He was serving as county tax assessor at the time. Floyd Hatfield was NOT related to Ran’l McCoy’s wife. Floyd’s wife, Esther Staton, was the daughter of Nancy McCoy, who was a first cousin to both Ran’l and Sally McCoy. Kentucky state law restricted a jury in a justice of the peace trial to a maximum of SIX members. In that particular district, the 1880 Census shows that in order to have had six McCoys on a jury, Ran’l McCoy and two of his sons would have had to be allowed to sit on Ran’l’s jury. Both families have a colorful background. My great grandmother was Aldine McCoy. I have the old black pot that they cooked over the fire with that she had. I was told that the day the Alamo was finally won she was cooking homony in it at the river. Other family members of the McCoy family fought in the Alamo also one has his name on the wall he was killed there. It seems that my grandfather lived with some of the McCoys in the mountains when he was a young man. Ahem! This site is wrong! My Great Grandmother is a Hatfield and this is not the true story! Anilse Hatfield does not deserve lies told in her name but her story known to all! was nancy mccoy a spy telling the mccoys were the hatfields were? Nancy McCoy Hatfield Phillips was loyal to her first husband, Johnse Hatfield until after the last feud violence in January, 1888. ON January 24, 1888 she swore out a warrant in Logan County for 24 of the Frank Phillips gang, including 8 men named McCoy. Sometime later in 1888, she moved in with Frank Phillips on Peter Creek in Kentucky. Johnse had absconded to the Pacific Northwest, leaving Nancy and the children behind. She remained with Frank until he died in July, 1898.They were married in 1895, after her divorce from Johnse was decreed. Nancy did in 1902, aged 36, of tuberculosis, called ‘consumption’ in those days. a large man and bare fisted boxer who moved his wife Hester Adkins & 13 children from the Appalachia to Illinois for a better life. I would love to learn more of my family history. Anyone know of a Bonnie Jean McCoy? I’ve been told she is my great grandmother on my father’s side. Any of her family know a Ben Johnson II who had a girlfriend with 2 boys and had trouble in Texas back in the 80s, please find me on Facebook! My Great, Great Grandfather was William Hatfield. Some facts I am proud of, some I am not. The fact is Hatfield or McCoy we must remember this was a feud of unfortunate circumstances as many people were killed and for what? Land, Love, Stature, Food. Regardless the reason it was a long time ago. Sadly, the world continues to feud in much the same way. Brother against Brother. Sister against Sister. Neighbor against Neighbor. I’m no saint no one is. Not in human form anyway, but to love one another in just that, in the spirit of love great things can be done, and are being done today. Everyday miracles.